The child of Holocaust survivors, Martin Lemelman was raised in the back of a Brooklyn candy store. His latest book, Two Cents Plain: My Brooklyn Boyhood, is based on that experience. It is published by Bloomsbury USA. Although he was always aware his parents were survivors, it wasn’t until he was an adult that he learned the full extent of their experience. His graphic memoir, Mendel’s Daughter is not only the story of his mother’s miraculous survival in the World War II, it is also the story of Jewish family life in Poland in the 1930s. The book was an Austin Chronicle pick for Best Books of 2006 and was a New York Public Library Selection — “Books For The Teen Age 2007.” Jonathan Cape/Random House has released an edition in the United Kingdom. 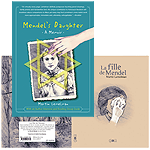 In addition, the French edition, La Fille de Mendel was published by Editions ca et la and the Spanish edition, La Hija de Mendel will be published in Spain by Norma Comics. Original art from Mendel’s Daughter, as well as, tapes of an interview with his mother are included in the show “Superheroes and Schlemiels: Jewish Memory in Comic Art.” The show has been exhibited in Paris, Amsterdam, Frankfurt, Berlin, and Victoria, Australia. Lemelman has lectured in Europe and throughout the U.S. He speaks about how memory, research, interviews and art come together in a graphic memoir. He has been a freelance illustrator since 1976. His client list has included McGraw/Hill, Children’s Television Workshop, Scholastic, Parent’s Magazine Press, and Crayola, among others. He has illustrated over 30 children’s books and his work has been published in magazines ranging from the New York Times Book Review to Sesame Street Magazine. Martin retired as Full Professor from the Communication Design Department at Kutztown University. He lives in Allentown, Pennsylvania with his wife Monica. They are the proud parents of four wonderful sons.